At the University of Toronto and other institutions, students in the humanities are mocked for the impracticality of their fields of study. They face questions about how they intend to translate their degrees into a living, with the implication that a specialist degree in philosophy or a major in classics is an unlikely path to a flourishing career. There is some evidence that humanities departments are on the decline, with enrolment numbers down, criticism in public discourse, and some universities considering slashing programs altogether. However, criticism of the humanities often fails to recognize the diverse skills that humanities students acquire from their degrees including reading, writing, and creative analysis — that are not oriented towards any single job; as well as the importance of learning for the sake of curiosity. The practicality of the humanities was not always in question. Beginning in ancient Greece and Rome, the humanities were long considered to be at the heart of academic institutions. Their prominence continued into the Middle Ages, when universities first developed. In the fifteenth century, fields of study began to be judged based on their practicality — rather than merely studied for the purpose of being studied, which the humanities ostensibly are. Today, the effect of this change in attitudes can be seen more than ever in schools across the world. Some studies indicate that fewer students are enrolling in humanities programs globally. Students and their families often evaluate programs based on the payoff of the job they can pursue after school in relation to the total cost of tuition and effort of achieving the degree. The perceived lack of practicality makes it difficult for students to justify spending money or incurring debt to pay high tuition fees. At Yale University, for example, 165 students graduated with a bachelor of arts in English Literature in 1991. This number plummeted over the next 20 years, with only 62 Yale English literature graduates in 2012. Elsewhere, universities have had to cut some programs due to low enrolment numbers. In England, Middlesex University was forced to shut down its philosophy, history, and performing arts departments in 2010. At the same time, British universities Keele University and the University of Greenwich were both considering cutting their philosophy programs as well. After students objected to the change, both universities decided to continue the programs for the time-being. The bad press for the humanities comes from a broader problem than their impractical nature; it is the result of the way people generally perceive universities today: as a means to an end. A university degree is meant to teach graduates skills that they will use later on in their careers. Many jobs require students to hold a bachelor’s degree, and therefore universities have the instrumental value of qualifying their graduates for jobs that they otherwise would not have access to. Humanities programs are not perceived as providing students with such marketable skills. The humanities are often viewed as an academic indulgence and a waste of money. However, students in the humanities gain a diverse set of skills in their studies that differentiate them from those in other departments and qualify them for a variety of careers. According to Christopher Warley, associate professor of English at U of T, the humanities involve studying human relations. The humanities offer some clear-cut practical applications, such as reading and writing skills that many students in science programs do not acquire through their degrees; however, students in the arts also develop unique skills in creative thinking and critical analysis. Rotman Commerce students can often find careers in business within months of graduation; architecture students are hired by top employers in their field; and life science students have a wide range of graduate school options, all of which can lead them to particular careers. The humanities hold a different place in universities, allowing students to learn for the sake of learning and satisfy their wide-ranging academic curiosity while earning their degree. While the idea of learning for the sake of learning is possible in every field, humanities students are able to do so differently than their peers in the sciences; can look at their studies as a mere satisfaction of their curiosity and nothing more. A student’s analysis of Bartleby’s repeated phrase — “I prefer not to” — can place it in its historical context and lead to conclusions about various social issues at the time of its publication, the character himself, and the author. However, these trains of thought will not earn them any one job at the end of the day, as — for example— an engineer’s understanding of physics forms the basis of the career they are likely to pursue. If the intention of universities was to have students learn a skill or a technique — or to attain a job with the completion of the degree — they would be the same type of institutions as polytechnics and colleges. As such, there would be no place for the humanities, many social sciences, and many other programs taken by themselves without an added graduate degree. Without the university, these disciplines would not have a place for the academic study that they merit. Arts students have the opportunity to satisfy their academic curiosity while improving their writing and analytical skills, and can pursue graduate school or a number of college programs afterward if they do not immediately begin careers — many of which are specialized and open only to those who hold a BA. U of T boasts some of the largest humanities departments globally, with top-rated professors and 85 diverse programs. Based on the qs university rankings, U of T has the fifteenth-best English and History departments in the world. The philosophy department is becoming more and more prominent in the philosophy world, holding the eleventh spot in the QS ranking, and stepping up in the Philosophy Gourmet rankings annually. Smaller U of T humanities departments also host high-quality professors and provide funding for research. For students studying humanities, U of T offers a wider range of courses than its competitors, along with opportunities for students to specialize in specific topics. The Independent Study program is offered in most departments, and provides top students with an opportunity to focus their studies on a particular topic under the supervision of a faculty member. Research and work-study opportunities are available to students as well, where they can help professors with their research in the arts and get credit for their work. U of T and other institutions in Canada are responding to increasingly negative attitudes towards the humanities in different ways. Professors incorporate diverse, ongoing research in the humanities with classic ideas and theories to illustrate to students how the texts and notions they are studying are still actively engaged. At U of T, the course “The Digital Text” is offered to English students, allowing them to engage with computer technology and math while studying literature. Many schools are accepting arts students in medical training programs, with McMaster teaching an undergraduate course in the developing international field of medical humanities. Courses like these point to the importance of humanities departments developing interdisciplinary programs that allow students to more clearly visualize their career options while continuing to study the arts. U of T departments often allow students to take relevant courses in other departments as part of their program requirements. 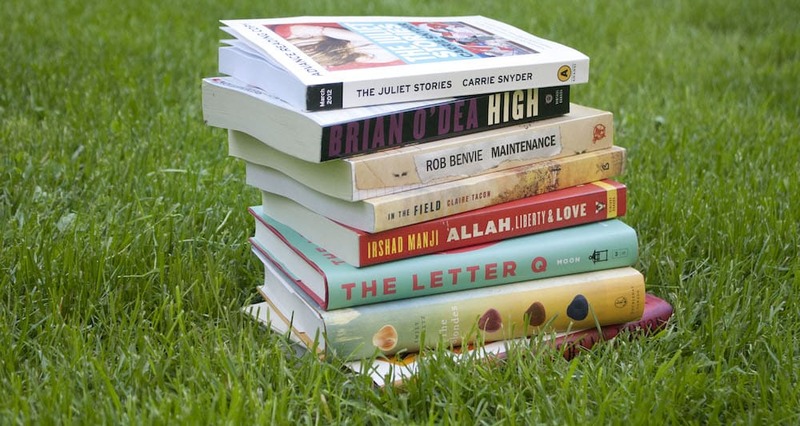 At the University of Ottawa, the World Literatures and Cultures master’s program is the first such degree in Canada, and allows arts students to explore modern global cultures from a variety of perspectives — including those in film, literature, language, and cultural history. Degree programs in the humanities can combat their image problem by seeking similarly innovative approaches to the study of the humanities that incorporate interdisciplinary elements and offer students a modern, flexible framework for their studies. As the last bottle of champagne is popped, the remnants of glittery, metallic wrapping-paper are painstakingly extracted from carpet fibres, and emails with syllabi attached trickle into UTORmail inboxes, it becomes clear that the winter break is approaching its end. Winter holidays present the opportunity for students to reunite and catch up with family and friends after a busy first semester. In my experience, wintertime food-and-drink-filled get-togethers have always inspired a particular stream of conversation, typically initiated with the question, “So, what are you studying now?” This eventually develops into a heated discussion about the usefulness — or, more often than not, the uselessness — of liberal arts degrees. Conversely, those supporting the arts often feel that they are voicing rebuttals from an already-losing side, and attempt to justify their choice of study by saying that the humanities make better people and better societies, or that liberal arts students develop superior verbal and written communication skills. These may not be the most effective defenses for English majors. A common thread uniting most of the arguments condemning liberal arts degrees is the notion that university arts departments are “soft,” “proudly disconnected from the job market,” and continue to “churn out” graduates who are “a dime a dozen” and lack the real skills that increase “employability” (as The Globe and Mail journalist Margaret Wente dramatically posits in her May 2012 article, “Educated for Unemployment”). Undergraduates pursuing arts and humanities are incessantly being force-fed the idea that they have chosen the wrong field of study, and will enter the job market with general — rather than niche, highly praised, and in-demand — skills. The reality is that liberal arts students are not only taught how to identify independent clauses, or avoid comma splice errors. Arts undergrads are trained to think critically — to pay attention to the nuances and texture of language — and are continuously enhancing their research skills by sourcing out and strengthening their arguments with the integration of primary and secondary sources. It’s easy to forget that English students have research skills, but mind you, they’re probably going to be branded as irrelevant, “soft” research skills, at best. A few weeks ago, I had the opportunity to attend a mentorship dinner offered by the “Backpack to Briefcase” (“b2B”) program, hosted by Andrew Gray, a partner at Torys LLP. These dinners, in conjunction with other events offered by the b2B program, provide students with the opportunity to meet, interact, and share anecdotes with classmates, faculty, and alumni of their field of study. The honoured guests in attendance at this particular dinner were once undergraduates of English literature, who have since attained successful careers in academia, law, journalism, creative writing, and environmental consulting. If there was one critical insight I left with that night, it was that arts degrees produce graduates with extremely malleable skill-sets, applicable to a diverse assortment of careers. It is an overstatement to claim that all students of the arts and humanities are superb writers and orators, yet it’s also an understatement to say that these students are only proficient in communicating. Liberal arts degrees create flexible job candidates, arguably willing to take risks, as they’ve chosen and continue to pursue a path that everyone seems to warn them against. Margaret Wente may have a point when she writes, “What [journalism] schools don’t provide is jobs in journalism,” but jobs are seldom simply handed out to graduates; graduates still have to put in effort, job hunt, or enrol in graduate programs, regardless of whether they have a degree in history or neuroscience. Perhaps something more problematic is the way in which the process of obtaining a postsecondary degree is being depicted — as a means to an end, wherein the venerated end is a relatively high-paying, secure, and somewhat permanent career. Teenagers are often pressured to have a detailed career path (with ten different, equally-detailed, back-up plans) ready-to-go for the first semester of Grade 12; a university education is increasingly viewed as one of many steps in working towards a predetermined goal. Arguments that unwaveringly blast arts and humanities programs, and demand that students have it all figured out instantaneously, tend to imply that a genuine interest in and individual satisfaction with one’s program is secondary. The message seems to be: “You can like what you study, but only if it gets you a job. You should apply yourself, enroll in, and ultimately succeed at whatever is more likely to get you a job.” While it is important to find a job and maintain a sense of realism, it is also necessary for arts students to challenge the over-used, unoriginal dictums taunting them. So why should one choose the arts and humanities, over another more media-approved, “employable” area of study? One reason is that a liberal arts degree provides graduates with general skills applicable to a multitude of disciplines. 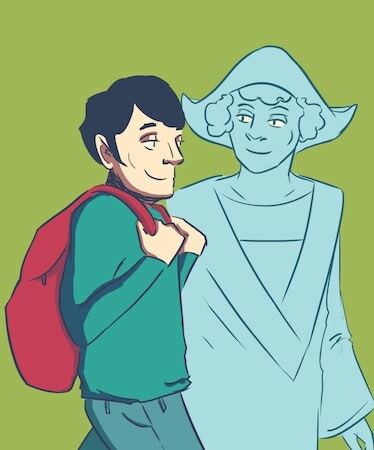 A second, yet arguably more imperative reason for choosing to pay for, and pursue, any field of study for at least four years is because you are genuinely interested in it, and have conviction in the idea that your studies will benefit you in some way — despite the arguments posited by your holiday companions. 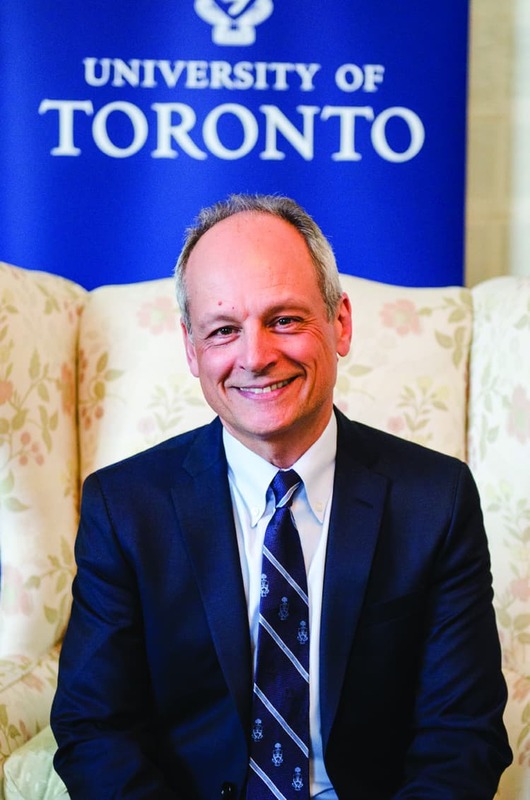 Last December, the University of Toronto welcomed its sixteenth president, Meric Gertler, with a distinctive mix of apprehension and congratulatory exuberance. While Gertler is no stranger to the university’s intimate workings — as the former Dean of the Arts and Science faculty — the weight of the challenges our university faces leaves room for a substantial array of concerns. Few individuals, however qualified, can be expected to single-handedly tame sustained structural unemployment, declining government funding for liberal arts programs, and a set of increasingly competitive online educational opportunities. Transforming the educational experience on campus will require Gertler to reassess the university’s local and global partnerships. It will require a neighbourhood approach to addressing the workplace’s needs as they balance with the broader community’s need for educated and publicly engaged citizens. Failure to engage with either set of interests, or to emphasize the need to produce world-leading graduates regardless of financial obstacles to higher education, is sure to endanger U of T’s prized position on global higher education rankings. Outgoing president David Naylor’s term at the university’s helm heralded a decisive transition away from the stodgy, traditionalist ways. Political factors were pulled from under the university’s feet as firmer educational funding terms were required to prevent a higher-education debt bubble. The rise of emerging markets prompted the university’s most respected rivals and admirers alike to invest substantial funds in satellite campuses and world-class educational facilities to match an ever-rising global competition for the very best students. On the ground, Naylor’s term was punctuated by one construction site after another, as U of T responded to these global trends with a concerted push to improve infrastructure, facilities, and program offerings. Bystanders saw efforts to make our professional faculties more competitive globally, as the business school faculty was integrated into many engineering programs, with an emphasis on commercialization of radical homegrown innovations. Gertler’s challenge, at the time of writing, will be to drive this adaptive momentum into a viable, responsive, and necessarily fundamental reorganization of undergraduate education, in order to best take advantage of the new vistas made available by his predecessors. Gertler’s strategy to address its main challenges is to reconfigure the university’s relationship with the City of Toronto, particularly its funders and government backers, with a greater proposed role for U of T in municipal and provincial-level discussions on innovation and policy. By rethinking these relations, Gertler hopes to recalibrate university curricula and offerings, in order to strike the right balance between the traditional ambitions of well-rounded, higher education with the pointed, practical exigencies of the contemporary workplace. These goals and stated ambitions are laudable, but they are anchored on the conditional hope that provincial governments will volunteer to jump to the liberal arts and non-professional programs’ defense. If this is not the case, as current discussions of intended strategy suggest, then we might be witnessing the receding line of accessible liberal arts education in Ontario. Indeed, if we need to halt structural unemployment, and if the private sector and its government-backing corollaries are in favour of equipping the Ontario student with the right skills, then departments with the least apparently monetizable course content will see themselves bunched together and plausibly starved to the professional faculties’ benefit. However, before we run to the slippery slopes, it is essential to underline that Gertler seems to favour a balance of both worlds: a liberal arts curriculum with a backbone of employable skills. An observer of this dilemma — an old one at that, but one that is more urgent given the times — might suggest that we also look to non-governmental sources of educational funding for the least unemployable faculties. Making these programs viable, regardless of how many billions our Ivy League competitors are spending or how many MBAs are required in the workplace, could be an opportunity for greater private-public partnerships for non-professional faculty educational funding. Regardless of the financial constraints on traditional liberal arts’ survival in a province such as Ontario, which is rife with structural unemployment, Gertler’s perspective is one that promises to engage with all stakeholders. Joint program offerings, joint research symposiums, and greater faculty engagement in the local community’s various needs promise to make the university that much more relevant. If there is a way to gain this greater relevance and employability while educating well-rounded graduates, it will definitely be found in greater consultation with our neighbours, locally and globally. In the age of super competition in higher education, it will definitely take a global village to raise employable, liberal arts educated graduates. Yves Guillaume A. Messy is in his final year of a specialist in political science. He is a political commentator on CTV National News. 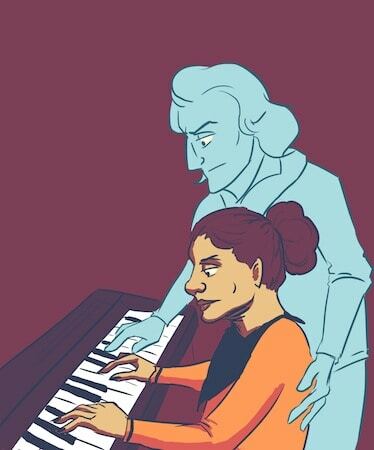 For those of us who are lucky enough to really love music, it can become a large part of what connects us to our particular time and place. 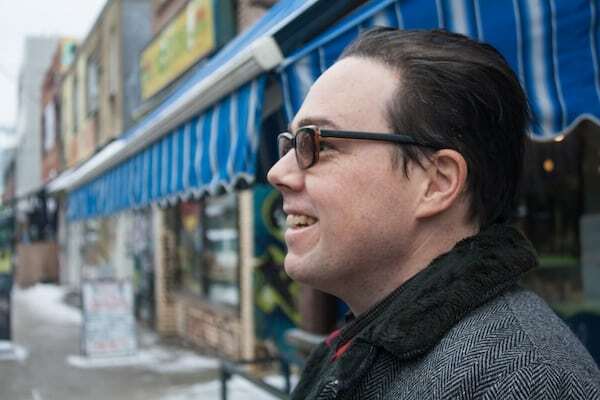 I am lucky to live in Toronto during this time because this city is home to wonderful improvisers such as Brodie West. When talking to West, it is no wonder that his presence here makes some of us feel more grounded, more defined. His positive air is apparent in his art, as well as in his every word. West has been playing the saxophone for 26 years. In that time, he has worked with musicians from Ethiopia and Amsterdam to this city of ours. Lately, he has been playing with The Ryan Driver Quintet, Terrie Ex, and many more. He showcases his own compositions with his band Eucalyptus and recently he put out a solo saxophone recording on Healing Power Records. The Varsity: In Eucalyptus, you work with great improvisers and there always seems to be a lot of room for them within your pieces. How do you account for that when you are composing? Brodie West: My compositions are organized on some levels, but the framework of them allows for a lot of room, I hope. I guess the challenge is communication — for everyone to be able to make sense of the materials of a composition. The pieces are not overly intricate. People don’t have to work too hard to find all the details so they can bring their own details into it. My style of writing is really melody and rhythm. There’s a big space in between for people to do a lot of their own thing. TV: What does a good composition feel like for you? BW: When it’s realized by the musicians people will open up to it. The players will really find a way to revel in it. To be able to just express themselves, feel the freedom, and to be able to really listen to it. Maybe the perfect composition is one that the players can hear themselves in. Everything with music is just the practice of listening. Listening is the most essential quality. That’s why people with limited technical skill are still able to make the right choices with what they’ve got because they can hear what’s going on and they can feel it. All the musicians in the band are good at doing that. I’m trying to create a really minimal structure for them to play. Something they could almost learn by ear with room for exploration. TV: What’s the difference in the way you compose for your solo stuff versus composing for Eucalyptus? BW: In Eucalyptus, it’s not all about what’s on the paper, it’s about communicating the ideas that are there and what it is that I’m dreaming about. It’s really hard to communicate the subtleties. That skill is the hardest thing for me, probably for my whole life, to try to do. The more you work with the same people, the more you have this catalogue of understanding to refer to. We’re not working in a tradition that’s been well-established. I’m drawing from all different backgrounds so nothing is really a given as far as putting a piece in front of people and assuming that they’re all going to interpret it from a certain vantage point. If you can try not to assume anything, then you can really experiment. TV: What about when you compose your solo stuff? Do you allow for space in the same way? BW: I find playing solo sax is all about time. I need time to get into it. It’s kind of about developing a language and having it at your fingertips. The solo stuff has to do with a kind of momentum. Not working on having a pulse but feeling intuition. It’s freeing in a way that I really enjoy — this thing about the mind wandering and the freedom to just ramble in different ways. It’s also about silence and what is left after you have made a statement. As soon as you stop in any moment there’s this sort of tension. I’m always using that, and that is creating the momentum too. I’m not circular breathing which is a standard thing to do with solo wind instrument playing. I’m allowing that breath. I think that draws people in. The quality of the recording too is quite close. TV: Is there some kind of code of conduct that underpins your practice? BW: At the risk of sounding naive, my first favourite musician was Charlie Haden, and he talked a lot about being honest. I don’t want to lie about anything. I don’t want to be clever about lying. I don’t even want to figure out a tricky way to be able to get at something. Music is a way to really be honest. A lot of people make these choices that are not very honest for themselves. It’s just survival, but it’s unfortunate that sometimes people get into this whole zone of misery. Charlie Haden’s words always stuck in my mind because when I hear his music it sounds like that and it takes courage to do that. He’s made a lot of great choices because he’s got that strength. I think from the Toronto community the strongest thing that I can associate myself with, and feel that I am a part of, is this freedom to experiment across all different genres. It’s such a struggle living here and there aren’t many real institutions or anchors so everything is really fluid. Musicians are able to do things in a different way as far as decisions they make. There’s no professional scene here for improvisers. In Amsterdam, for example, there’s this million dollar club for improvisers and when people play there they get paid really well and they live as professionals. Here no one is a professional so no one has anything to protect in that sense. Everyone is willing to take a chance and do different stuff. Every moment feels really open and full of potential for things to happen. 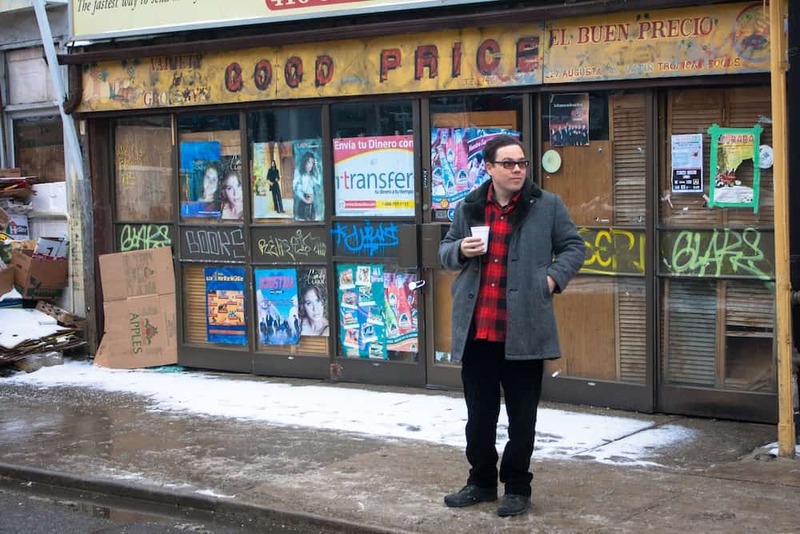 Eucalyptus will be releasing a new record in February during their month long Sunday residency at Hirut Cafe and Restaurant (2050 Danforth St). While many celebrate the coming of a new year, with resolutions of fitness and growth, the United Nations Educational, Scientific, and Cultural Organization (UNESCO) strives towards a different goal: promoting science to the general public world-wide. 2014 has been marked as the International Year of Crystallography (ICYr). This project is a joint effort by the International Union of Crystallography and UNESCO, with the goal of promoting education on the importance of crystallography in science and in society. X-ray crystallography is the examination of patterns in diffracted X-rays to determine the crystalline atomic structure of solids. Despite the small number of people who have heard of X-ray crystallography, its role in science and society as a whole is virtually unparalleled. Since the preliminary work of Johannes Kepler in ice crystal symmetry in 1611, the role of symmetry in nature has enthralled scientists. X-ray crystallography has led to the discovery of many properties of crystals. Max von Laue was awarded the Nobel Prize in Physics in 1914 for the discovery that X-rays travelling through a crystal were diffracted in specific directions, and hence their behaviour depended on the nature of the crystal. These are the foundational experiments upon which the field of X-ray crystallography is built, and since von Laue’s discovery, over 45 scientists have received Nobel Prizes for work either directly or indirectly related to crystallography. Among these accomplishments are many important discoveries: the discovery of the structure of penicillin, leading to the betterment of millions of lives; the control and processing of anti-viral drugs, since crystallography helps researchers study the effectiveness in binding to viruses; and perhaps most importantly, the crystallization process that makes that perfect piece of chocolate melt in your mouth, as naturally occurring forms are inedible. At U of T, crystallographic research has led to the discovery of a molecule labelled penicillopepsin, which has been critical in improving the lives of those who suffer with AIDS. From medicine to confections, X-ray crystallography is the foundation of many life-saving and important medical and industrial applications. The future of the field is very promising, with advancements predicted in efficient eco-friendly materials, and a possible solution to antibiotic resistant bacteria. Current studies in crystallography seek to win the war against drug-resistant bacteria, also known as “superbugs.” Ada Yonath and colleagues are close to creating antibiotics to eliminate bacterial ribosomes while leaving those of humans unharmed. 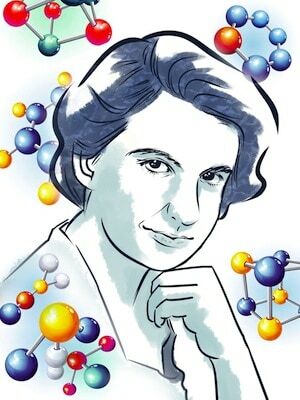 She won the Nobel Prize in 2009 for determining the structure of ribosomes in bacteria, without which bacteria could not survive. The field of X-ray crystallography continues to contribute to advances in various disciplines, as the community of crystallography labs around the world expands. With the start of the IYCr, UNESCO hopes to achieve more global awareness of this crucial field, and hopes that in this new year, science will play a larger part in our lives than ever before. Dame Kathleen Lonsdale was a British scientist who made significant contributions to X-ray crystallography. Using X-ray diffraction methods, she discovered the structure of the benzene ring, settling a decades-long dispute. Lonsdale attended a high school for boys in order to take courses in mathematics and science that were not offered at the girls’ high school. In 1927, Kathleen married Thomas Jackson Lonsdale. They were both scientists, Quakers, and pacifists. Evenings were spent doing science: Kathleen did her work on paper, and Thomas, working towards his doctorate, did experimental work in the kitchen. Kathleen’s habit of working in the evenings continued even when she was jailed for a month for refusing to take part in civil defense activities, which would have been in conflict with her pacifist convictions. She turned her cell into a laboratory with papers and instruments sent from colleagues. She was one of the first two female Fellows of the Royal Society, and she was the first woman to receive tenure at University College, London, where she was head of the Department of Crystallography. She was also the first female president of the International Union of Crystallography. Lonsdaleite, a form of carbon present in meteorites, bears her name. Dorothy Hodgkin, a pioneer of protein crystallography, was described by her biographer as a brilliant scientist “whose humanity recognized no national boundaries.” Hodgkin was the first scientist to successfully use X-ray crystallography to study complex biomolecules. She confirmed the structure of penicillin, and later discovered the structure of vitamin B12 and insulin. Hodgkin was the first female recipient of the Copley Medal, and the third female Nobel Laureate in Chemistry after Marie Curie and her daughter. Hodgkin also tutored Margaret Thatcher in chemistry and established a laboratory at Oxford. Throughout her constant struggle with rheumatoid arthritis, Hodgkin continued to excel at crystallographic research despite its delicate and precise nature. Hodgkin campaigned against nuclear weapons and supported scientists in developing countries in the later part of her career. Franklin is best known for her X-ray diffraction work that led to the discovery of the structure of DNA. In the late 1940’s and early 1950’s, the race to discover the structure of DNA was on. Franklin, a physical chemist by training, worked with Maurice Wilkins in X-ray crystallography at King’s College. Meanwhile, Francis Crick and James D. Watson were working at Cavendish Laboratory at Cambridge. The crystallographic images that Franklin produced were crucial to Crick and Watson’s discovery of the structure of DNA, although the Cambridge team did not have her permission to use the images, and she was not credited in their paper. Nonetheless, Franklin and Wilkin’s experimental work complemented Watson and Crick’s theoretical approach, and Crick, Watson, and Wilkins shared the 1962 Nobel Prize in Physiology or Medicine. Franklin had lost her life to cancer four years prior, but Wilkins recognized her “great ability and experience of X-ray diffraction” in his Nobel Lecture. The academic environment during Franklin’s career was intensely hostile towards female scientists. Despite her significant contributions and her considerable skill, she did not receive fair recognition for her work at the time, and she was represented as incompetent and disagreeable in Watson’s memoir, The Double Helix. A biography of Franklin, as well as numerous protests against Watson’s portrait of Franklin by her colleagues and reviewers, helped to set her public image straight. Her tragically short life is now recognized as one of brilliant scientific achievement. In her early career, Ada Yonath was labelled “the village idiot” for her unpopular ideas in biochemistry and structural chemistry. In 2009, she won a Nobel Prize for those same ideas, becoming the first Israeli woman to do so. Yonath created Israel’s first biological crystallography laboratory at the Weizmann Institute, her alma mater. She sought to understand the structure of ribosomes, and was harshly criticized for pursuing her pioneering line of work. Yet she found success: she worked out the structure of the small ribosomal subunit using X-ray crystallography. This work would prove to be essential to the study of antibiotic resistance. She shared the 2009 Chemistry prize with Venkatraman Ramakrishnan and Thomas A. Steitz, whose research had also led them to structural models of ribosomal subunits. Yonath was also the first female recipient of the Nobel Prize in Chemistry since Dorothy Hodgkin received the Prize in 1964. After suffering a concussion while playing catcher for the Varsity Blues’ baseball team, Kyle Bowers enrolled with the University of Toronto’s Accessibility Services. He was required to fill out several forms to get accommodation for his classes. Bowers did not like seeing the word “disability” on his forms; his identity was steeped in the image of a male student-athlete, with all its trappings: the personal fitness level, the hyper-competitiveness, and the social status. “I wanted to scratch out ‘disability’ on all the forms, and write ‘temporary impairment’,” he said. The concussion was an unfortunate result of a foul-tip. “Usually, it’s a glancing blow,” Bowers said. The ball strikes at an angle, rather than directly with full force, and deflects off the catcher’s facemask. The team trainer saw what happened and gave Bowers a concussion test on the sideline. He did several word associations and number memorizations with him. “I passed,” Bowers said, using air quotes, “but athletes tend to under report things. I felt terrible the rest of the game.” Bowers’ adrenaline kept him playing — he ended up hitting a double that contributed to an important win. When the adrenaline wore off, Bowers tried to take a nap on the team bus, but could not fall asleep. After assuming that a night’s sleep would do the trick, Bowers went to class the next morning, but the headache was not going away. 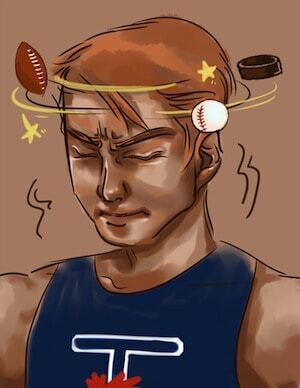 He was concerned that if he confided in a doctor, he wouldn’t be able to play baseball, but the headache kept getting worse. By the afternoon, he broke down and scheduled a doctor’s appointment for the next morning. Medically, Bowers felt taken care of. But recovering from a concussion goes beyond the quality of the care that he received at U of T’s MacIntosh Clinic. Bowers was told to sleep in a dark room. He chose his basement where he was hidden from light and his family, friends, and teammates. He couldn’t watch TV, send text messages, or go out on the weekends. Bowers couldn’t wait to get medically cleared. He wanted to get back onto the diamond with his teammates as soon as possible. In his first two seasons, the Blues had won back-to-back championships and were hoping to add onto the streak. The first step was to be symptom-free for 24 hours. After that, Bowers could try some light exercise. With doctor’s orders, he started using a stationary bike, but the headaches and the dizziness weren’t ready to go away. He was back to step one: the dark room. Between the dark room and the doctor’s visits, Bowers was trying to get floating extensions on his schoolwork. His doctor felt the resulting stress contributed to his setback. His kinesiology professors understood — they were familiar with concussions. As Bowers found, however, other professors were not as accommodating. His notes would say to follow up with his professors in seven days, so his professors would offer a one-week extension. The problem was that Bowers didn’t have a timeline from his doctor for when his symptoms would go away. After more rest, Bowers managed to get through light exercise without any symptoms, and was cleared for baseball-related activities like light catch and batting practice. Bowers travelled to Wilfred Laurier University and hoped to play at Western University the following week. To do that, he had to remain symptom–free after a team practice. His teammates were excited to have their catcher back. “My teammates see me, you get the whistles, the cheers… look who’s back!” said Bowers. The practice went well, his teammates thought he was back to normal, and everyone was excited. But soon after, his symptoms returned, and it was back to the dark room. Bowers’ season was over — he had reached his nadir. “I think I felt worse than I did before… because I realized I’m not ok.” The doctor told him that he would have to take even more time off from exercise after his latest setback, but Bowers was also given some good news. Barring being a statistical anomaly, Bowers could be cleared to return next fall. “Concussion symptoms do go away,” he said. He’s excited to return next year, but disappointed that he lost half of his season to injury. However, Bowers did manage to learn from his experience. Bowers now prides himself on his newfound sensitivity on matters of disability. He also feels personal responsibility to help other student-athletes who find themselves needing advice on brain injuries. He can tell them about the time he wanted to scratch out the word disability. Sweeping changes designed to save students thousands of dollars were announced by Minister of Training, Colleges, and Universities Brad Duguid in early December. After four years of student union lobbying, protests, and controversy, the provincial government has introduced regulations to phase out U of T’s policy of charging full tuition to students who take as few as three courses — generally known as flat fees. The new guidelines, introduced on December 5, also eliminate interest fees incurred because of the Ontario Student Assistance Program’s (OSAP) distribution schedule, mandate two payment periods for tuition, and regulate the types of late and ancillary fees that can be charged. Starting in fall 2015, students who take 3.5 full course equivalents or more (FCEs) will be charged full tuition. In 2016, that threshold will rise to 4 FCEs. Currently, U of T has a flat fee threshold at 3 FCEs. In addition, students with a disability will now be charged tuition on a per-credit basis, regardless of their course load. Individual domestic students who take three courses may save up to $2,300 per year under the new guidelines, according to Alastair Woods, chairperson of the Canadian Federation of Students-Ontario. Individual international students who take three courses may save up to $13,000 per year. Although Woods sees the changes as a step in the right direction, he still advocates a return to per-credit billing. Agnes So, vice-president, university affairs, of the University of Toronto Students’ Union (UTSU), echoed Woods’ sentiment. Although So is pleased with the government’s response to student concerns, she also advocates a return to per-credit billing. “We need to keep pushing until there is no longer a way that students can be forced to pay for courses they do not take,” So said. The UTSU has opposed the flat fee structure since it was first announced in 2009. Although student groups are happy with the changes, the university has expressed concern. In a December interview with The Varsity, U of T president Meric Gertler said that the changes to the flat fee system will eventually cost the university $16 million annually. The latest available financial information on the Faculty of Arts & Science, from 2010, shows that the faculty has an accumulated deficit of over $60 million. According to Emily Hedges, a spokesperson for the Ministry of Training, Colleges, and Universities, the changes arose from concerns expressed by student groups leading up to the release of Ontario’s new tuition framework in March 2013. To address these concerns, the ministry established a working group with representatives from Ontario’s colleges, universities, and student groups. According to Yolen Bollo-Kamara, vice-president, equity of the utsu, the root of the university’s financial problems is underfunding at the government level. “Underfunding causes high tuition fees and high student debt that tends to affect marginalized groups most,” Bollo-Kamara said. The guidelines also address tuition and payment dates. Currently, students with osap loans are required to pay tuition fees at the same time as students without the loans. Under the new system, students who complete their osap applications by the beginning of August will not have to pay tuition before receiving their financial aid. All students will also be able to pay tuition in per-term installments without deferral fees or interest charges. The changes will begin rolling out at colleges and universities in the 2014–2015 academic year, with full implementation by 2015–2016. 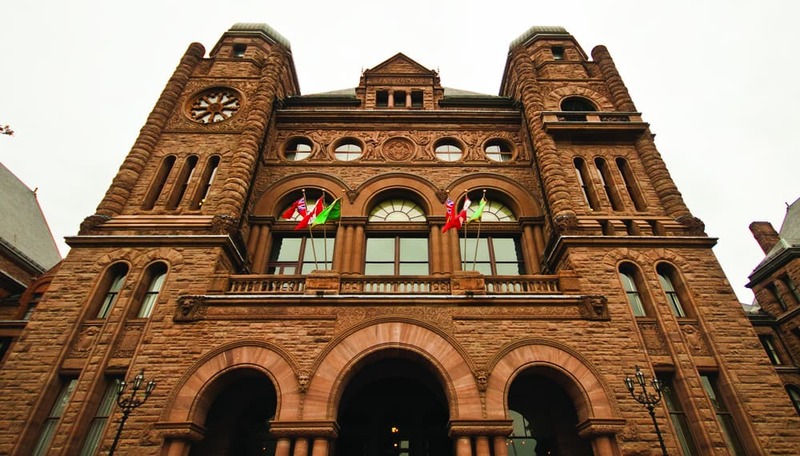 Funding for Ontario’s post-secondary institutions may undergo some major changes towards a more differentiated system by the spring of 2014. The system, proposed by the Higher Education Quality Council of Ontario (HEQCO) with the province’s Ministry of Training, Colleges and Universities, expects institutions to focus on those elements where they have particular strength. Currently, the distribution of funds is largely based on full-time enrolment, with larger universities receiving more through provincial grants. Differentiation requires universities and colleges to focus on a certain aspect to specialize in — whether it is specific subject areas, types of students, or research intensity — and the funding will be allocated accordingly. As a result, the prioritization of these areas will thrive, while costs will be reduced, as less necessary functions are limited. 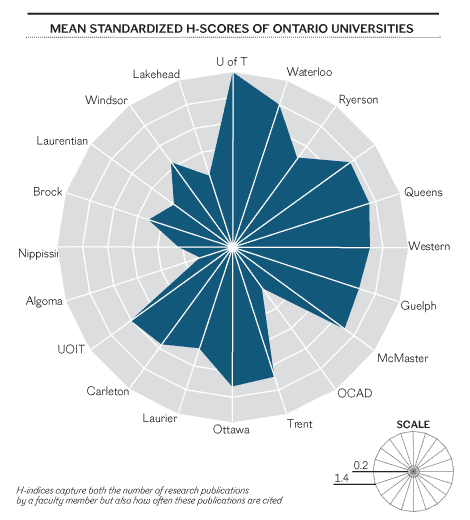 In a report released in July, aimed to inform the discussion on differentiation, the HEQCO suggests Ontario’s universities be split into four categories, primarily based on research intensity. Based on the data presented, it suggests that U of T is in a category by itself. The report compares Ontario universities based on variables such as enrolment, percentages of graduates with PhDs, and sponsored research income. U of T leads in all these areas, by a very large margin. 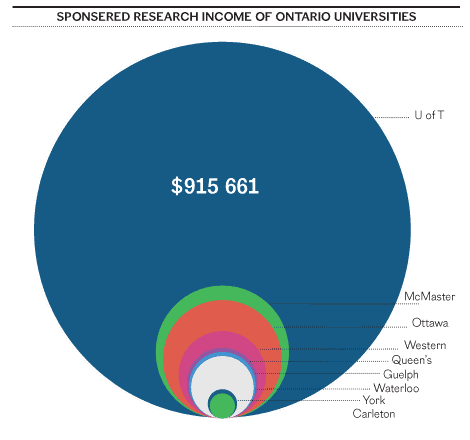 For example, U of T’s sponsored research income of $915,661 is three times more than that of McMaster, which has the second-highest research income. While U of T is in its own category, other universities are split between those that are research-intensive ­— including McMaster, Western, Ottawa, Waterloo, Queen’s, and Guelph — and those that are undergraduate-focused, including the University of Ontario Institute of Technology (UOIT) and the Ontario College of Art and Design (OCAD), and another group of universities — consisting of York, Carleton, Windsor, and Ryerson — that fall in-between. British Columbia works on a similar system, with universities split into four categories: research-intensive universities, teaching-intensive universities, colleges, and institutes. Alberta also functions on a differentiated system, called the “Six Sector Model.” Institutions are categorized into six sectors: Comprehensive Academic and Research, Baccalaureate and Applied Studies, Polytechnical, Comprehensive Community, Independent Academic, and Specialized Arts and Culture. The province offers different types of funding granted to institutions based on their mandate. In the UK, a similar system exists to the one proposed for Ontario. The Higher Education Funding Council for England (HEFCE) distributes its funds based on the results of a Research Assessment Exercise (RAE), which analyzes the quality of research and productivity of universities, and providing those with superior research with more funding, while also encouraging less research-intensive institutions to refocus in other areas and “rewarding” them appropriately. However, neither jurisdiction categorizes a university in a cluster of its own. U of T, which already receives the largest amount of government funding in Ontario, is also ranked significantly higher in world rankings than other institutions in the province. Compared to the world however, U of T does not offer smaller classes and revenue per student is significantly lower than its competitors. While a differentiated system would allow U of T to continue to develop and maintain its position as an internationally competitive, research-intensive university, other institutions may be at a disadvantage. There is concern that a differentiated system will reduce the level of autonomy of institutions and inhibit smaller institutions from aspiring towards a higher level. The government argues that differentiation aims to contribute towards the sustainability of post-secondary institutions. It cited in its differentiation policy framework that the need to adjust the system is due to the government’s demanding fiscal situation. It also pointed out the cost of institutions exceeding growth in revenues from operating grants and tuition as a financial concern.